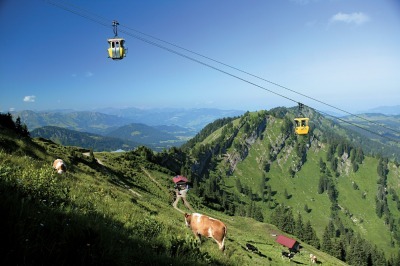 Free access to the longest downhill run in Oberstaufen with the Hochgrat cable car : free ascent and descent to the unique panoramic view of the mountain summits and an altitude of 1.800 metres invites you to sunbathe, relax and stop for refreshments. The sunset rides and full moon rides are included. Free access to the Hündle cable car: including free ascent and descent with the Hündle cable car for hiking or a rustic snack in an alpine hut. “Kurpark” Oberstaufen for crazy golfing. Oberstaufen PLUS Winter A guest card instead of a ski pass: enjoy your winter holiday with activities such as downhill skiing, sledging, cross-country skiing, winter hiking, snow shoeing and sunbathing. The ski passes for four ski resorts in Allgäu are free of charge with Oberstaufen PLUS. That makes skiing even more fun!